I was reading the news online and came across this topic about iphone. 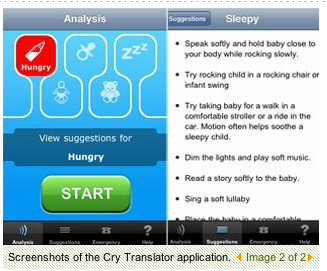 I think this app is pretty useful for those parents that have a uncontrollable crying baby. I've been hearing people say baby can be a nightmare especially during nights. The babies can cry every other 20 minutes and you could be trying your best to make your baby stop crying but still won't work. So, for a $US9.99 ($10.99), it is worth it and it will save your time and effort to stop babies from crying and make the baby happy (and parents too!). It was on thewest news, so i guess it's quite reliable? 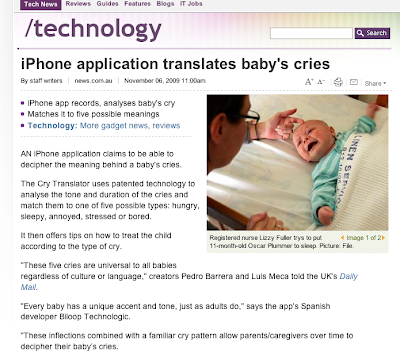 "The application, which takes about 10 seconds to record and analyse a cry, had over 90 per cent accuracy rate during the clinical tests with 104 infants." For just US9.99 what else can we complain about haha. it's worth a try for the parents.